Weighty Matters: Biggest Loser MD Deluded, Unethical or Clueless? Take your pick, but I think he's got to be one of those three. His name is Dr. Robert Huizenga and last week he presented a Biggest Loser themed report at the 21st Annual Scientific and Clinical Congress of the American Association of Clinical Endocrinologists in Philadelphia. 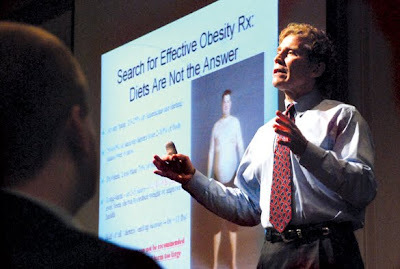 The presentation detailed what an overly excited press release called a "pioneering study" whereby Huizenga found that when looking at 35 contestants from seasons 11, 12 and 13 of The Biggest Loser, severe dietary restriction combined with insane amounts of exercise dramatically improved metabolic outcomes including diabetes and hypertension. That's "pioneering"? Is it really news that weight loss and exercise improve diabetes and hypertension? The only outcome related to hypertension and diabetes that would have been surprising to me would have been if they didn't markedly improve. But where I'm truly left dumbfounded is Huizenga's reported consequent belief that the Biggest Loser modality of weight management - literally a minimum of 4 hours a day of exercise coupled with a highly restricted diet - is, "a better mousetrap". I'm not sure what world Dr. Huizenga comes from, but in the one where I live people, even if they want to, don't have four spare hours a day to exercise. You see in my world people have jobs, families and other real-life-actual-human-being things that regardless of their weight or health intentions, are going to supersede any misguided physician's recommendations that in order to be healthy they need to spend every third waking hour of their lives in a gym. I'm thinking if 4 hours a day of exercise is his "better mousetrap", he'd best be prepared not to catch any mice. And there are more differences between our two worlds. For instance in mine virtually everyone knows how incredibly unrealistic and perhaps even unethical it would be to suggest a better mousetrap had been built if it's build was based on Biggest Loser contestant outcomes without looking at whether or not those outcomes were preserved when the show turned off its ever present cameras. Not so apparently in Huizenga's world where his conclusions are indeed based on Biggest Loser participants' outcomes recorded only at the end of their 24 week contest. An end where his subjects were all still competing for huge sums of prize money, and where they were still being followed by television cameras, millions of viewers, and the potential to turn their experiences into careers. Hardly an end that's clinically applicable to the general population. There's one other piece that's really bothering me. Why did Huizenga's study only include 35 contestants? By my count that's only 59% of those seasons' contestants. A pretty terrible loss to follow up in a venue where as is evidenced by each season's finale, there's virtually no loss to follow up. Huizenga's apparently applied for a grant to compare outcomes between bariatric surgery and Biggest Loser contestants. If funded let's hope that his study design doesn't include subject cherry picking, and that his follow up period is at the very least a clinically useful few years long, though given what he's done here, I won't hold my breath hoping for an ethical and appropriate methodology. As to Huizenga's motives - well aside from supporting his show and television career I can think of two: Cognitive dissonance and confirmation bias. Those two? They're like the bed bugs of science, except instead of spreading disease, they spread delusion. Someone ought to fumigate that guy.